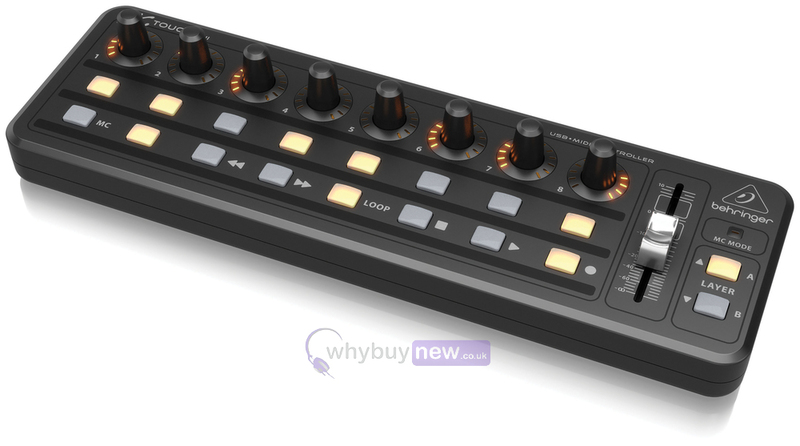 The Behringer X-Touch Mini is an ultra compact universal USB control surface that has a lot of fantastic features. The Behringer X-Touch Mini can connect to a PC or MAC through a USB cable that also powers the unit as well, which means no more looking for the power cable! It has a user friendly design and is ready to go straight out of the box which is great for anyone looking for their first USB control surface. The X-TOUCH MINI Ultra-Compact Universal USB Control Surface puts the power of your production software right at your fingertips! 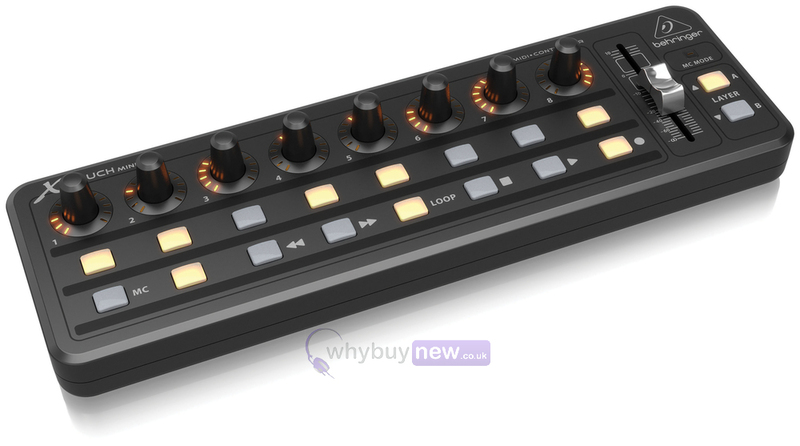 The user-friendly and extremely versatile X-TOUCH MINI gives you take-anywhere, hands-on control of all popular DAWs, instruments, effects and lighting applications. Let your creativity run wild when you get your hands off your mouse and onto this nifty little controller! Todays DAWs, instruments, effects and lighting applications are designed to interface with controllers that enable users to make high-precision changes with minimal eff ort. 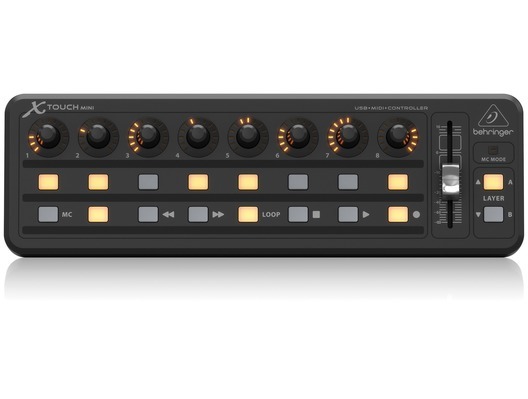 Built-in Mackie Control emulation allows your X-TOUCH MINI to work with virtually any professional audio production software imaginable as soon as you take it from the box no setup required! The X-TOUCH MINI features a long-lasting 60 mm master fader, and a Dual Layer Mode for quick changes between DAW and instrument control or switching between any two applications. For example, a DJ can use one layer for virtual synths and the other to control lighting during his show. Or an engineer in a house of worship could control lighting on one layer and playback from a DAW in the other. You get right to being creative quickly, because the MINI comes with pre-configured control elements for instant operation out of the box. However, you are also free to customize the experience with our free, downloadable and user-friendly editor app. The MINI features 8 rotary knobs with LED collars for on-the-fly adjustment of your favourite parameters. It also has 16 dedicated, illuminated buttons (including transport control) for direct access to key functions of your DAW. 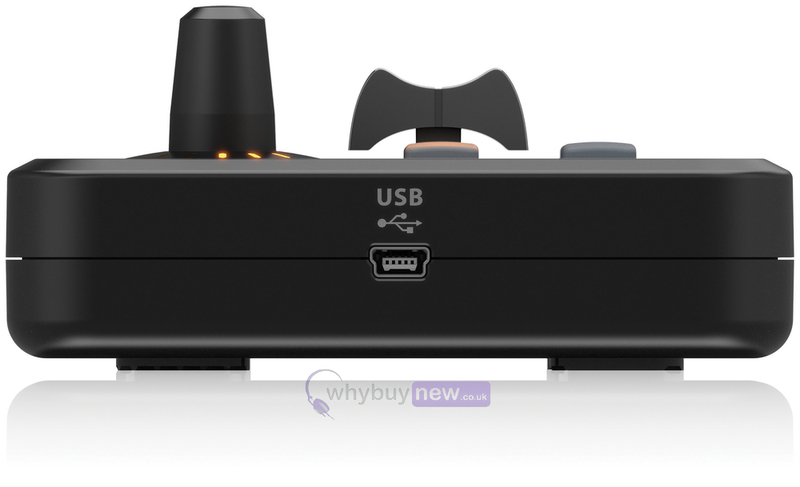 The built-in USB/MIDI interface allows direct connection to your Mac/PC, and for future add-ons of other controllers no drivers required. Just plug into the X-TOUCH MINI for immediate access to 2 layers of awesome control! The ultra-compact design easily fits in your backpack and allows cascading or adding other X-TOUCH models. Power is supplied via your USB bus, so you no need to carry a power supply and the high-quality, rugged construction means you'll have this trusty MINI-workhorse by your side for years to come. Visit your local dealer or online reseller and get hands-on control of your software in a way you never thought possible. The X-TOUCH MINI lives up to the old adage that big things come in small packages! Tracktion is one of the worlds fastest and easiest Digital Audio Workstations (DAW) for composing, recording, editing, mixing and sharing your music with the world. Featuring a single-screen interface, and pushing the envelope in design elegance, Tracktion brings together outstanding Pro DAW features, such as dynamic automation, unlimited track count, MIDI recording and support for VST and AU plug-ins. This powerful music production software gives you all the tools of an entire professional-grade recording studio. Learning a DAW has never been easier, thanks to their vast and readily available library of resources.